CROWD CONTROL Teams of robots working in tight, crowded spaces (like those above) could work more efficiently if a few bots do most of the work. When tiny sea algae get sick, they may sneeze the seeds of clouds. Robots, take note: When working in tight, crowded spaces, fire ants know how to avoid too many cooks in the kitchen. Observations of fire ants digging an underground nest reveal that a few industrious ants do most of the work while others dawdle. Computer simulations confirm that, while this strategy may not be the fairest, it is the most efficient because it helps reduce overcrowding in tunnels that would gum up the works. Following fire ants’ example could help robot squads work together more efficiently, researchers report in the Aug. 17 Science. Robots that can work in close, crowded quarters without tripping each other up may be especially good at digging through rubble for search-and-rescue missions, disaster cleanup or construction, says Justin Werfel, a collective behavior researcher at Harvard University who has designed insect-inspired robot swarms (SN: 3/22/14, p. 8). Daniel Goldman, a physicist at Georgia Tech in Atlanta, and colleagues pored over footage of about 30 fire ants digging tunnels during 12-hour stretches. "To our surprise, we found that there's only about three to five ants doing anything" at a time, Goldman says. Although individual ants' activity levels varied over time, about 30 percent of the ants did about 70 percent of the work in any given 12-hour period. To investigate why fire ants divvy up work this way, Goldman's team created computer simulations of two ant colonies digging tunnels. In one, the virtual ants mimicked the real insects' unequal work split; in the other, all the ants pitched in equally. The colony with fewer heavy lifters was better at keeping tunnel traffic moving; in three hours, that colony dug a tunnel that was about three times longer than the group of ants that all did their fair share. Goldman's team then tested the fire ants' teamwork strategy on autonomous robots. These robots trundled back and forth along a narrow track, scooping up plastic balls at one end and dumping them at the other. Programming the robots to do equal work is "not so bad when you have two or three," Goldman says, "but when you get four in that little narrow tunnel, forget about it." The four-bot fleet tended to get stuck in pileups. 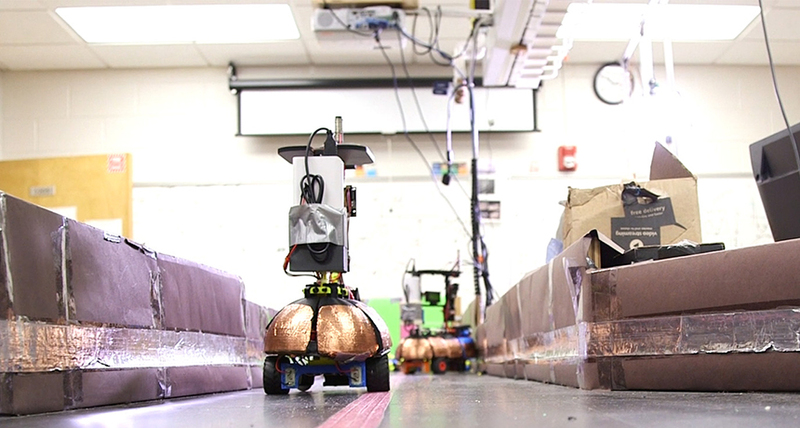 Programming the robots to share the workload unequally helped avoid these smashups and move material 35 percent faster, the researchers found.